Well here I am at Costco, considering steak for dinner – then I look at the pack for 2 steaks and as I almost faint considering the portion size and feel the need to ask my buddy to put a hand there to show some perspective. At this point I’m thinking 2 things – 1. steak is not on for dinner and 2. what kind of shock will I experience on my first trip to Texas (where everything is bigger and better I’m told)? Fred Flintstone did not eat steaks of this size on a cartoon – and now I’m supposed to just pick them up at Costco and go home – how many weight watchers points would one be do we think? I’m fairly certain that it would feed a small village for a month. So this last weekend I headed off to a retreat for some Yoga, Meditation, Vegetarian food and general peace at the Hari Krishna Ashram in the Catskills. A mere 2hrs away is snowy peace – along the way we noticed these people had decided to cheer up their winter yard with beautiful hanging baskets of fake flowers all around their yard! Arriving we dropped our luggage off and headed straight for the sauna house. Yoga started at 4pm – a 2hr class and a vegetarian banquet for dinner left us happy. Meditation and chanting at the temple ended our night which sent us off to bed. 5.30am (I kid you not) we were up and getting ready for our hour long silent mediation walk. Sounds great until you realize it is pitch black as the sun is not even thinking about getting up. Walking in the dark in snow and cold should be enough to have you thinking “she’s finally lost it”, but I have to say (after light started and I was absolutely sure I would not fall, break my neck or get eaten by a bear – yay for hibernation), I loved the hour long walk. On to another 2hr Yoga class and brunch – considering my own superhero outfit at this point. Next is clearly some more sauna time and an afternoon nap which left me waking just in time to rush down to the 2nd yoga class of the day for 2hrs (that is 4hrs people – where is my cape?). I’m feeling particularly proud of my first shoulder stand. More delicious dinner, meditation (how does anyone sit cross-legged for over an hour?) and chanting (finally a place where no one would even think of pointing out that I can’t sing and should shut up immediately)! There is definitely a lot to be said for a chill out weekend that I will be repeating every couple of months….blissed out! Christmas starts with magical martinis…so I spent Christmas this year in Chicago again although this time with Jackie and Nigel who stayed home this year (yay). Xmas eve on Monday night was a night of catchup, dirty martinis (North Shore Gin really is the best gin in the world), lots of wine and fantastic snacks. Xmas day on Tuesday started with a lazy breakfast before opening presents and planning the day’s movie going (1. Skyfall – he really is the best Bond after my beloved Sean and 2. Abraham Lincoln – who knew he was shot? Certainly not covered in my school history classes, but hey now I know and by an actor no less). A great way to spend Xmas day is actually going to the movies, lots of fun. Dinner meant Jackie cooking up a storm (Moroccan Chicken) and more dirty martinis (Deaths Door Gin really has the potential for putting you there actually), lots more wine, too much port (final count only realized a day later) – yes we were all a bit dusty the next morning (well OK Nigel and I were – Jackie actually worked) but a good time was had by all. Then it was Wednesday = recovery day – I bicycled off to get more spices from the most incredible spice store in the world that just happens to be in Chicago (in 0 degree weather – I am a legend), I found an amazing French bakery with the best coffee and macaroons, which were essential after my Scott of the Antarctic adventure (OK so I did feel virtuous after riding around in the snowy Chicago weather and a little deranged, yet somewhat French with a baguette in my bicycle basket – albeit a frozen one by the time I got back). A healthy dinner of delicious sushi (sans martinis lest we actually land on Deaths Door) and a movie. This movie was the most amazing combined effort in movie ordering – Step 1 – order a movie from Netflix (1st one – not so good, so find another one after 10 mins of deciding we should put it out of it’s misery), Step 2 – Discover Netflix is now down and we can’t watch better movie that we ordered, Step 3 – Try millions of times to get to Netflix on TV, PCs, Macs etc….then give up that movie and attempt I-Tunes for another movie “Arbitrage” (an hour to download – really?? and then some online help to deal with the stupid new I-Tunes interface, Steve Jobs would be horrified with what they’ve done wouldn’t he? Well I damn well am and now have a lesson to go learn how to use the stupid new version which is not intuitive at all), Step 4 – aaaaahhhh there is Richard Gere and all is well again in the world (really going to the actual movie theatre was a lot less hassle). Thursday dawns and it’s snowing – sooooo, you know you are a dedicated massage devotee when you walk a mile and a half through snow to get there (I know I’m sounding old right now but at least it’s not trudging with bare feet to school through snow etc etc)….but damn if I don’t feel great now after a fantastic massage and the very delicious Vietnamese sandwich from my beloved Saigon Sisters before I left Chicago. Finally back home in NY – after the flight which saw me staring out the window fascinated whilst they sprayed stuff all over the plane wings to deal with the snow – at least that’s what I assume was happening given no one else on the flight seemed remotely concerned with this situation going on out my window and I didn’t want to be the only person (read here – Aussie with no clue about the effect of snow) on the plane with NO idea what they were actually doing – what was that stuff anyway??? 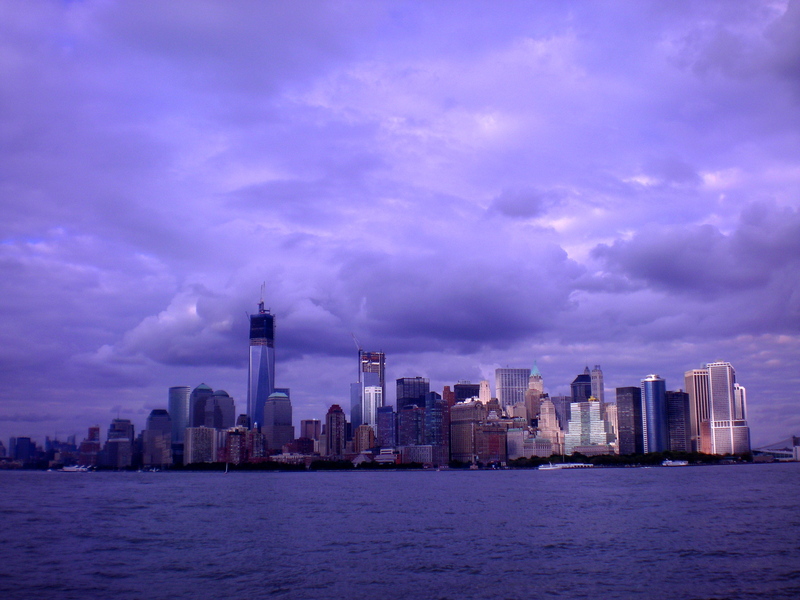 Yesterday was a spectacular day sailing on NY harbor….not least because the day was overcast and cloudy. The weather made for some fantastic photos and sailing at dusk into the night was incredible, kind of like the night I went to the top of the Empire State building when it was sub-zero temps – things really are amazing at night in the city. You see things you never notice in the daytime. So here’s one of my favorite photos of the day. Now I just need to spend more time doing things like this…sailing, dinner, cocktails, lots of laughs – priceless! Well hello my name is Oscar and I’m holidaying at Leanne’s house while my family are in Disney World Florida. I am a Westie like McTavish and we look a LOT alike. I am writing her blog today as she is busy cooking. This will of course involve scrumptious things that are for me! 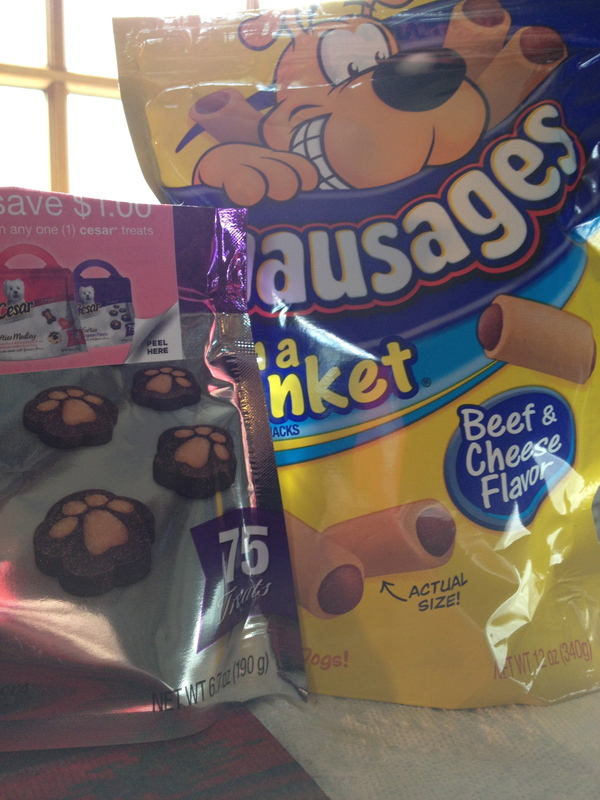 Although, she already got me great special treats (2 bags). In fact, she left the nice little fillet mignon mini paws on the table and went to the bathroom. Clearly this was a message that I should jump on the table and eat as many as I can as fast as possible. I excelled and won the game, I ate all 70 of these little mini treats! Today I’m a bit sick, I keep feeling ill and my tummy hurts but I don’t know why? We go outside a lot to the toilet today. Here in the US, the tax year runs Jan 1 to Dec 31. At home, I hated tax time, but here I actually look forward to it…why you ask? 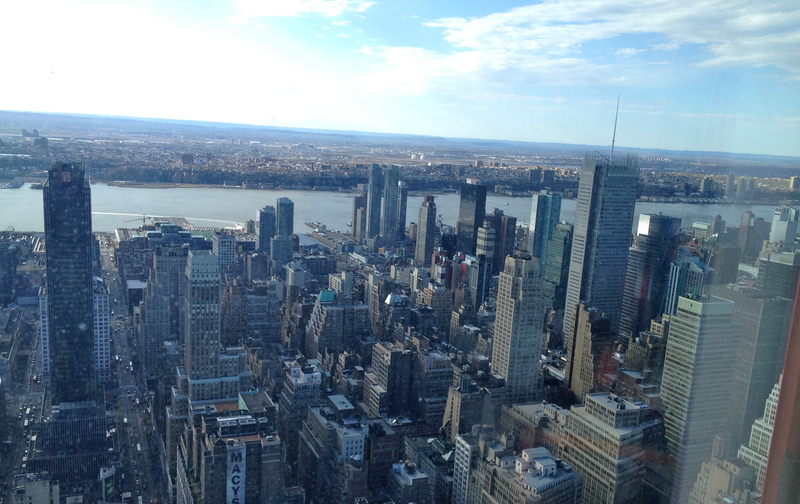 Well for starters, I have the best accountant in the world (thanks to Jackie and Nigel), then I get to go to his office which has an amazing view of the city (he has the corner office on the 71st floor of the Empire State building) and then…..he is the only accountant that has ever dropped his fees (this I’ve never heard of in my entire accountant visiting years, normal practice is to raise them each year)! So here is the view from Ed’s office (yes I take pics while he wades through the tiny bits of scrunched up papers relating to tax stuff that I give him – he should be knighted, bronzed then cloned and distributed throughout the accounting profession globally). And then after this years tax visit, I got to have dinner with Jackie who just happened to be working in NY instead of her hometown Chicago. 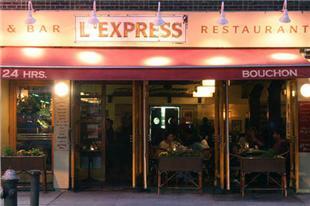 So we found a new restaurant, L’express, which is actually open 24hours a day (love this city). Not that we were eating at some abominable hour, 8pm since Jackie was working late. What can I say, another great find! So after a sublime salad nicoise, an amazing lamb burger with harissa (french moroccan) and a waiter who happened to hit the money with wine selections for us we happily pronounced a new find (in a city of millions of restaurants, it’s not often you need to return to one since it’s so easy to try the ever rotating opening of new restaurants or the established ones you haven’t been to yet). Finished off with a tarte tartin which was lovely and not too sweet, but just perfect and lots of conversations about her upcoming visit to Ireland (short Easter holiday), her work in Milan (it’s a hard life being an IBMer) and what books should be written for the good of mankind. Is there any better way to spend a day doing taxes?